Ladies and Gentlemen, we have a new WINNER! Apparently state fairs in the U.S. seem to compete annually to offer the most outrageous thing we can put into our bodies. Could there be anything worse than the Fried Butter at the Texas State Fair? 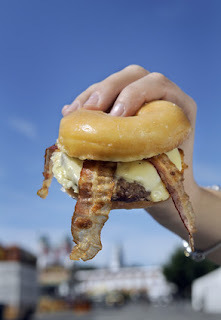 Well, maybe so: an entrepreneur at the Big E (the Massachu- setts State Fair) has created the Craz-E Burger: a cheeseburger with two strips of bacon wedged between a glazed donut! A new taste sensation? Salty and sweet? Crunchy and chewy? Probably more like heart attack and stroke. Do you think there will ever be a speed-eating contest for these babies? It probably wouldn't be to see who could eat the most in thirty minutes, but more likely to see who was still alive after eating these for thirty minutes! I have two sisters-in-law who can't wait to go to the Big E to enjoy the foods. Girls, I think you're Craz-E!! The Victorian Era created and developed many simple but powerful advertising concepts that are still used in the 21st century. One of the most easily recognizable is the Before-and-After illustration. This technique was illustrated on many advertising trade cards by showing the picture of a sick person before using the featured medicine and then a second illustration after doing so. It was a favorite technique of quack medicine makers for claiming miraculous curative powers. The illustrations are so well done, so dramatic, and usually funny, it would be a great category of trade card to collect all by itself. Another version of the Before-and-After used the same technique with the addition of a folded-over piece of the card whereby the Before is shown with the card in folded position and the After is revealed when the card is opened. These are known as Mechanical cards. They are often found torn apart at the fold because many of them have not been enable to endure the century and a half of folding and unfolding to see and enjoy the Before-and-After images. A card that is still solidly connected at the fold is a special little treasure. 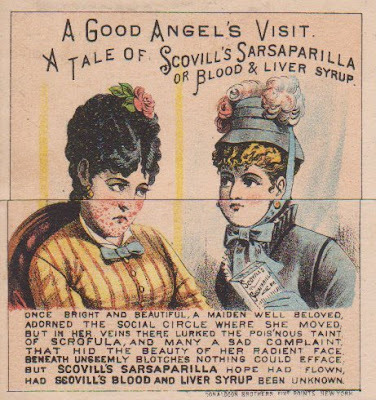 Below are the Before-and-After images for a Mechanical trade card of Scovill's Sarsaparilla or Blood & Liver Syrup. It constantly amazes me just how much power and what influence the proprietor's message could communicate by a well-conceived and well-executed image. 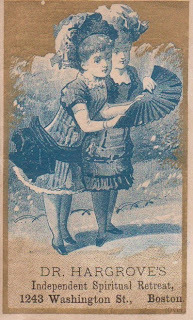 Let me walk you through my observations of the Scovill's trade card attached today. The pretty young lady on the left clearly wants to be out in the world; she has on a nice dress, earrings, and has her hair carefully quaffed with a rose decoratively accenting it, but alas! the lower half of her face has broken out with acne eruptions, severely affecting her looks and her self-confidence. What is a girl to do? Wow! What a difference a single bottle of Scovill's Sarsaparilla Syrup can make! Our heroine's acne has completely disappeared and her complexion is now the Victorian ideal of alabaster with a slight blush in the cheeks. She has been transformed from a forlorn damsel in distress into a vivacious Victorian hottie. She exudes confidence and sexuality; her anxious and sad look changes with a flash of the card into that of a sultry flirt. She has traded in her school-marm look with buttoned-to-the-neck collar and full sleeves, for the fetching, daring dress of a young socialite, with an hourglass waist and festooned in flowers. Previously embarrassed by her skin, now she wants to show as much as she can, baring shoulders, arms, and cleavage. She has also covered her arms and neck in jewelry (gold, of course) apparently just in case her body exposure doesn't attract enough attention. Scrofula was the disease ascribed to impure blood, manifesting itself as virtually any type of surface eruptions, rashes, or discolorations. Scrofula was also the umbrella term used to include syphilitic illness. But since Scovill's Sarsaparilla Syrup cured and cleared up our heroine so thoroughly, she's ready to party again. Powerful medicine. Powerful advertisement. GLORIOUS NEWS TO THE AFFLICTED! I vividly remember finding this unassuming trade card. I was at Brimfield, the largest outdoor antique fair in the U.S., about ten years ago. It was hot and dusty because I was near the street at the time and my feet and back were aching from being bent at a 45-degree angle over the dealers' tables, thumbing through boxes and bowls containing trade cards. I was feeling a sympathetic bond to these little scraps of paper, carelessly tossed naked (no archival sleeves, no unarchival sleeves) and sometimes jammed into shoeboxes then callously fingered by people bent on speed at all costs so that they can get get back to the hunt for the next box load of paper scraps. These cards suffer more bent corners, scratches, and tears in one antique show then they have from the previous 150 years of their fragile existence. I feel that I don't buy trade cards - I rescue them. But I digress. I suspect the trade card collectors who did their quickie groping through the box near the dusty street at the Brimfield show passed by this particular card because it was "just a common." The front is a common stock card image, but the card turns out to be anything but common. I know that it wasn't because they all had this little treasure. It was the first one I'd seen and I've only seen one other in the ten years since this show. Some probably made the mistake of seeing "Independent Spiritual Retreat" on the card front and just figured it was some kind of religious card, like those put out by the American Tract Society. Not so. Dr. Hargrove was a dyed-in-the-wool spiritualist and a person who claimed to heal others with the help and aid of the spirits of the departed with whom he could commune. Many of these spiritualists laid claim to having a "spirit band," a sort of consortium of spirits who were dedicated to channeling through a particular mortal medium. Dr. Hargrove had his allies in the spirit on whom he could rely to help him in his calling as a doctor; he mentions his spirit band on this card. They apparently helped him to build a table unlike any that you or I have seen, with holes and tubes connecting the patient to the central container of leaves and roots, etc. It almost sounds like sick people were having a seance at a round pool table whose pockets and passages were filled with the healing aroma of healing leaves and roots instead of the clacking of cue balls. 1243 Washington Street, Boston, Mass. This wonderful invention consists in disposing the medicinal substances from which the operative or healing effect is to proceed, in a Closed Chamber of suitable form and dimensions, having a covered passage from the inside of the Chamber to an opening or openings near the patient, over which openings the patient to be treated places his hands. The Chamber which is to contain the medicinal substances is located in a table with circular top, and from the inside of the Chamber are made in or under the table top, covered passages extending to openings in the upper surface of the table around and near the edge of it when not in use. These openings are fitted with and tightly closed by suitable ornamental covers. 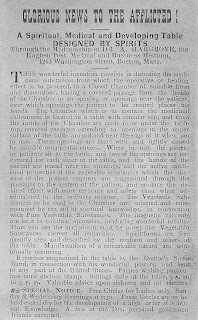 When in use, the patient or patients sit at the table, and two of the openings are uncovered for each sitter at the table, and the hands of the patient are placed over the openings, and the active medicinal properties of the vegetable substances which the disease of the patient requires are transmitted through the passages to the system of the patient, and produce the desired effect with more certainty and safety than when administered in the ordinary manner. The Vegetable Substances to be used in the Chamber are selected and compounded by the aid of spiritual knowledge, in connection with Pure Vegetable Substances. The magnetic currents are kept in constant operation, producing wonderful results. Substances correct all impurities. Spirit forms are frequently seen and described by the medium and others at the table. Manifestations of a remarkable nature are continually occurring. Remedies magnetized in the table by the Doctor's Spirit Band, in connection with his wonderful powers, and sent to any part of the United States. Parties wishing particulars must enclose stamp. Sittings daily at the table, 9 A. M. to 5 P. M. Valuable advice upon sickness and all matters. Special Notice. Free Circles for Ladies only, Sunday & Wednesday Evenings at 7:30. These Circles are to be held especially for the development of a high order of Spiritual Knowledge. A few of the Drs. personal gentlemen friends excepted. Dr. A. Hargrove was Alfred Hargrove. Born in England about 1848, he was a grocery clerk in Boston in 1870, was practicing as Dr. Hargrove in Boston around 1875 and was in Providence, Rhode Island in 1880, listed as an astrologer. What a wonderful effort to teach 12-year-old William Roberts about the series of immunizations he was going to get. William was the son of Edward and Lucy Roberts; Edward worked on the railroad. 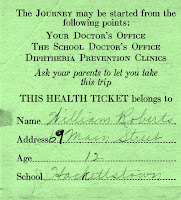 No doubt, this vaccination card, designed to look like a railroad ticket book, connected for young William as well as his parents. This was one train ride they were going to make sure their only son completed. So it was scrupulously heeded and preserved, and now we have the opportunity to admire and learn from it today. The following white pages are connected, accordion style, between the green covers. 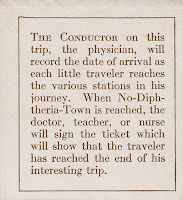 "The Conductor on this trip, the physician, will record the date of arrival as each little traveler reaches the various stations in his journey. 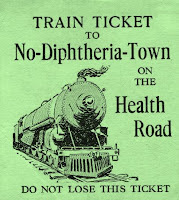 When No-Diphtheria-Town is reached, the doctor, teacher, or nurse will sign the ticket which will show that the traveler has reached the end of his interesting trip." Now I'm at Station No. 2. 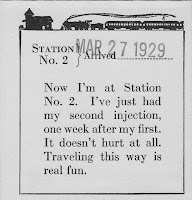 I've just had my second injection, one week after my first. It doesn't hurt at all. Traveling this way is real fun." I'm almost there! 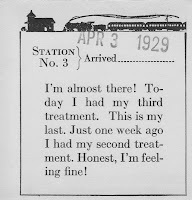 Today I had my third treatment. This is my last. Just one week ago I had my second treatment. Honest, I'm feeling fine!" Hurrah! 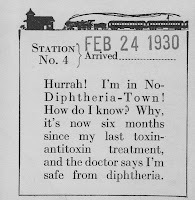 I'm in No-Diphtheria-Town! How do I know? 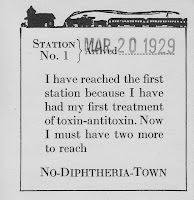 Why, it's now six months since my last toxin-antitoxin treatment, and the doctor says I'm safe from diphtheria." Diphtheria is a dangerous illness of the upper respiratory tract. In the 1920s it infected over 100,000 people (mainly children) in the U.S. and killed over 13,000 (mainly children). About half way through the decade vaccinations became available, along with a massive public awareness and education campaign. The Roberts booked their young son on a one-way ticket that might have saved his life. Science was beginning to replace quackery. One more product endorsement from the house of freaky wallpaper. 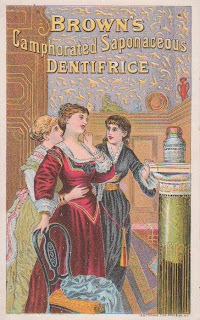 Brown produced another dramatic and colorful trade card, this time for their Camphorated Saponaceous Dentifrice (translation: toothpaste with camphor oil and soap). Camphor oil is used in modern topical cold remedies, but it can be dangerous if taken internally, causing seizures, breathing difficulty, or worse. Saponaceous is one of those lovely Victorian word choices that take the elaborate, poetic path to describe something quite common, in this case, soap. (I also love "tonsorial artist and capillarial abridger" to describe a barber. Maybe the folks at Brown's used those two long words to keep the name Brown as far away from Dentifrice as possible; if they called it just Brown's Dentifrice, it would have sounded more like a tooth product that didn't work.) So, when these ladies opened the jar of Brown's dentifrice on the pedestal, scooped out a little of the tooth powder, added water and stirred it into a paste, they were getting ready to put a soapy and potentially dangerous product into their mouths. I say ladies, but it looks like only one is getting ready to give it a try; in fact, it looks like she's getting a touch of the vapors just thinking about this great product; the friend behind her looks to be steadying her so she doesn't keel over! The new product is just sooooooo exciting! She's beautiful - they all are - Victorian babes, I guess. They're also all dressed very well, in frills, lace, and jewelry, and the woman in red looks to be in an expensive satiny or silky dress, and the home they're in is well-appointed with nick-nacks, carpeting, and detailed woodwork and furnishings. So this is the tooth product the beautiful and wealthy people use! Can you believe that people could be so easily influenced by an add to buy a certain product? Embarrassing that our ancestors could be so gullible, hmm? The lady in red is one of the two central characters in this little Victorian melodrama. The other is the bottle of Brown's Camphorated Saponaceous Dentifrice. Standing tall, corked, and handsome at stage right, on top of a fancy pedestal, like a classy, iconic statue in a chic Victorian parlor, the mere sight of the bottle made our heroine's knees wobble. It also was an extremely large bottle (I've never seen a toothpowder bottle this large); in advertising, at least, size apparently does matter. And companies like Brown gave these cards away for free, to get them into the home so that women, especially, would see them and daydream, even for just a few moments, that they could be that beautiful, that rich, that carefree. This isn't just a trade card; it's an early slice of the American Dream. As promised, here are the two bottles I picked up from Scandinavia that were just too pretty to leave behind. Bottle collectors wax poetic when describing the shades of colors of their bottles; personally, I'm a novice at such things, but I'd call the Oxygenol bottle "honey-amber" and the beer bottle "teal". When I was in the Swedish antique shop admiring the sun passing through these two bottles in the window, I could hear them cooing to me, "Buy us. Bring us home." How could I resist? They are now in my south Texas window, muttering, "Haftigt! (Wow! in Swedish) It's so hot here - take us back to Sweden!" Sorry my beauties, but you're all mine now! The best I've been able to uncover so far about Oxygenol is that it was hydrogen peroxide, used in the 1890s and 1900s as a dental disinfectant. Perhaps somebody from Sweden can shed some light on it. I do notice that there is an Oxygenol company in Sweden today, making tubes of toothpaste. The teal bottle probably contained the most favored form of Swedish medicine ... booze! Apparently used as both a cure-all and a preventative, from what I observed when I was over there! By the way, I added a comment to the previous post about the Ether and Turpentine bottle pictured. Nicholas and I did some interesting research and I think we came up with what its intended use was; please check it out (click on the Comments to September 11 posting). Do they quack in Sweden & Finland?? My wife and I went to Sweden and Finland about six years ago to visit the land of her ancestors. It was a great trip for her and it became great for me when I found some old bottles in little country antique shops in Sweden and Finland. Today I'll show you two labeled ones that I would love some translation help with. Tomorrow I'll show you two others, non-labeled, that are just beautiful colors. I'm pretty sure these are both medicines, probably from apothecary shops. Whether they were quackery or not can probably be determined when these words can be translated into English! Okay, all you Swedes, Finns, and Swede-Finns, please help me out! What do these say? I'm thinking the aqua bottle below contained Ether and Turpentine. Am I close? As we have already seen with Dr. True's Pin Worm Elixir (see blog date August 18, 2009), the Victorians feared getting worms and with good reason. Tape worm eggs and larva could be in their meat and pin worms eggs could hitch a ride under fingernails and be accidentally ingested, or passed from one person to another by touch or breath. 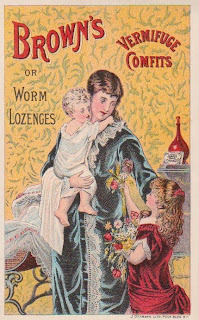 There were lots of vermifuges (worm-expelling medicines) on the market in the 1870s, 1880s, and 1890s because there were lots of worms, and they got bigger, scarier, and more numerous in the medicine makers' ads and the readers' minds. 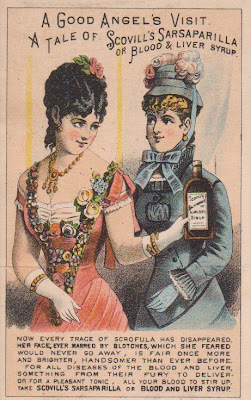 I love this trade card image. Mother and daughter look relaxed and carefree because they use Brown's Vermifuge Comfits (notice the box on the table in the background), but the baby looks like she's holding on to her mother's neck for dear life! Why? Well maybe because of that wiggly worm-like wallpaper behind Mother! Subliminal advertising was already happening in the Victorian Era and if anyone had experienced a bout with any type of worms before, that wallpaper was probably a harsh reminder that they should be giving regular doses of worm medicine to themselves and their children. In another tease of the subconscious, the box of Brown's is placed strategically between the happy family and the wormy wallpaper, suggesting its role as a protector against the hideous things that were ever ready to attack. Jeepers creepers! It seems that people in the late 1870s didn't want to exercise any more than they do today. This advertising trade card explained that more than half of the "human family" was suffering from one form of lung disease or another. Tuberculosis, known then as Consumption, was indeed killing a great many. It seemed to be literally consuming those it afflicted: they became deathly thin, pale, and frail; they had no energy. In advanced stages, their lungs withered and they spit up blood. 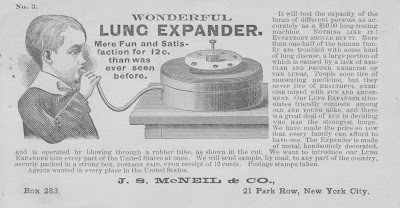 The J. S. McNeil & Co. of New York City knew there was a big market for a product that promised to restore the lungs to good health. They decided that lung diseases were being caused by people not getting enough healthful exercise. So they used a time-honored solution: if you can't make people do something, trick them into doing it. They made breathing fun. As this young lad is demonstrating, one simply needed to blow into one end of the long flexible tube to cause the machine to do something. My guess is that the smaller round disk on the top would spin around and rise up on the pole as it did so. The speed and height of the revolutions was determined by the air pressure of the blowing the person was doing on the other end of the tube. The ad copy promises that people never tired of the apparatus, which combined healthful exercise with fun and amusement. Something fun that would increase lung capacity - sounds great. I can imagine people competing with each other, taking turns blowing into the tube to see who can make the disk turn faster and go higher. Victorians of the late 19th century were fascinated by new inventions, new amusements, and easy, inexpensive ways to improve health, which is to say they were very much like we are today. What they did not yet understand was that the bacteria teaming in and on the tube could end up killing them. A sample form of the machine could be ordered for a mere 12 cents. Cheap enough, but today a policeman will let you blow into a breathalyzer machine for free! BREAKING NEWS: New AQUA Winner! It surprises even me. MSN greeted me with the news this morning that the Texas State Fair will be debuting yet another new fried food creation. This baby isn't even being sold yet (the fair starts on 9/25), but it has already leaped into the AQUA winner's circle! It must be pretty stunning, huh? Oh, it is. The second AQUA winner is Fried Butter. Yup, that's it - bite through your lump of deep-fried batter to find a ball of 100% pure butter. Once you've tried those morsels, you can go back for the garlic, grape, or cherry flavored fried butter chunks. I can't resist quoting from the MSN article by Laura T. Coffey ("Move Over Twinkies: Deep-fried butter is here," today.msnbc.msn.com, 3 Sep 2009; photo also from that site), "An order of fried butter will get you three or four pieces of piping-hot dough in a little cardboard boat. 'Any more than that and I think it would be a little bit too much,'" the wise creator of these deep-fried delicacies said, "A little bit too rich." Hmmm ... I'm thinking maybe three or four too many? Hey, doesn't it sound like the perfect accompaniment to the KFC Double Down Sandwich! "I'd like a Double Down with a side of Fried Butter; make my drink a Fried Coke and for dessert I'll have Fried Nutter Butter Cookies." If you go to this year's Texas State Fair, you'll find more deep-fried taste treats than just fried butter. Yesiree Bob. Be on the lookout for Fried Peaches and Cream, Fried Pecan Pie, Fried Peanut Butter Cup Macaroons, and much more. Why the obsession with fried foods at the fair? Because people want them. We keep pushing the limits of what our mortal, delicate bodies will endure - all to momentarily satisfy the bumps on our tongues. Tongues win over brains a lot these days. Don't you worry about the fried foods at the state fair. They're gonna sell like hotcakes ... fried hotcakes. Trophy shop delivers the AQUA! I tasked my son - whoops, I mean my trophy maker, with the impossible: design an award that combines a trophy look with quackery and the Oscar from the Academy Awards. I think he did an awesome job and he came in within budget, too (which was $0.00). 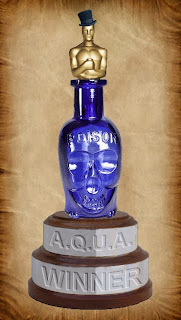 I was originally thinking of an aqua-colored patent medicine bottle for the middle of the trophy, but his choice of the famous cobalt skull poison is, of course, perfect, because it has so much in common with the AQUA winners. So there you have it. Every future AQUA winner will be announced with the AQUA trophy graphic in the blog entry. There's another winner looming on the horizon, but I won't be revealing it until sometime next week. Right now I'm not feeling too well and my healer wife is visiting her family back in New England, so I'm on my own to cure myself. I'm thinking dark chocolate.